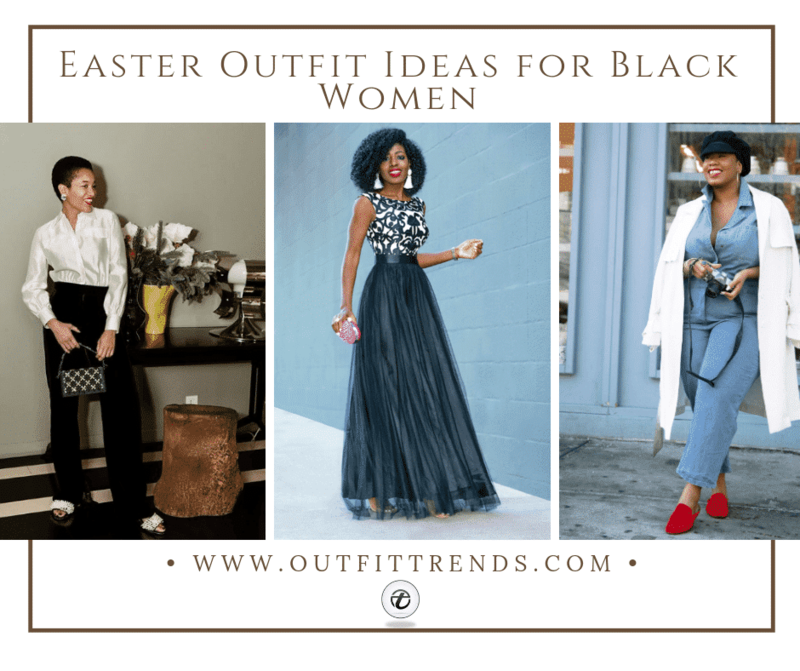 Easter Outfits For Black Women – With Easter right around the corner it is time to put on your shopping shoes. Take a tour of the mall to explore the wonderful things the fashion world has to offer you and make sure you find the perfect outfit for the special day. Putting together an outfit for special occasions can prove to be a tiresome task, especially if you’re not sure what exactly to go for. Whether you have an elaborate party arranged for Easter or are just going to the mass with family, we have suggestions for you so you won’t have to stress. So to make things easier, we are here to guide all you lovely, black women about this year’s trendy outfits and the perfect way to pair it up with your favorite accessories. So pull out your notebook and take notes! Depending on your preferences, you can choose your pants to be of slim cut, culottes, bell bottoms, or even boot cuts. As for the shirts, you can go for a cold shoulder, off the shoulder, blouse with pearls or rhinestones attached to it to look funky or just go with a plain blouse if your pants are printed and you want them to really stand out. Another outfit perfect for black women is dress gowns. Printed, solids, whatever you like, but a long evening gown is elegant, classy, and a safe bet to look gorgeous this Easter! If you want to tone things down a notch and have a slightly informal look, cute Easter sweaters with denim is a big YES. Whatever dress you choose, never say no to accessorizing it. The pleasant weather allows you to flaunt your pretty scarves with your outfit. And if you don’t want to take a scarf, wear a neck piece or some tassel earrings to complete your outfit. If you keep your makeup minimal, finishing it off with a red lipstick works wonders. It makes women with dark skin tones look absolutely beautiful. 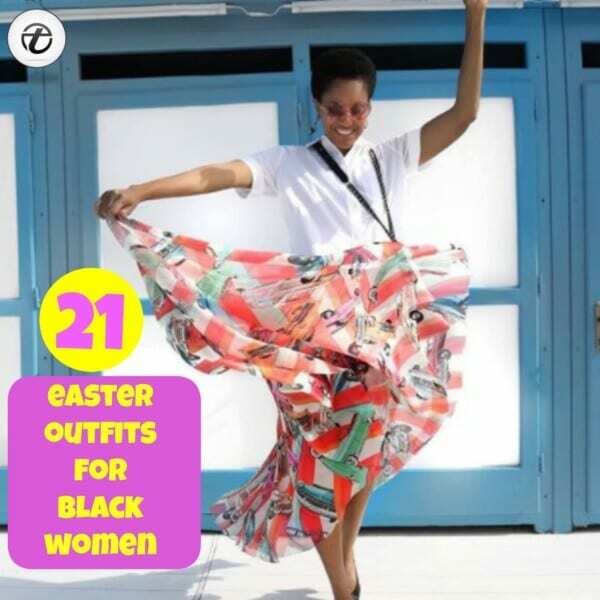 To give you more outfit inspiration we have rounded up a list of 21 best outfits to wear on Easter for black women. Check them out! If you are tired of mainstream dresses, this is a great option for you as it will make you look trendy. In case you have planned lunch out with friends, this is the perfect look for day time. Micro check dresses are quite appealing and the off shoulder look is pretty flattering. You can wear this outfit with a black choker and open-toe heels. Here are 23 Best Easter Outfits for Plus Size Women 2019. If you do not want to wear a completely plain dress, you can go for an embroidered dress such as this one with red rose embroidered on a black swing dress. It is easy to create this dress for yourself by taking some flower motifs and hot glue gun in your hand. The fitted waist and flared skirt of the dress create a playful look ideal for Easter. With high neck collar, dainty pearl earrings look pretty awesome. Tie your hair up in a ponytail for a sleek look. Easter is all about looking festive and giving it your best. You can go for a formal look with a draped one shoulder midi dress such as this one with a matching pair of heels. The cinched waist will give you an amazing hourglass look and the length of the dress ensure that you will not break any dress codes. Wear large hoop earrings and bold lip color for a stunning appearance. A crocodile pattern clutch will give the whole look a romantic and sweet touch. Pleated Maxi skirts look great, especially in dark colors. Whether you choose to wear it in the high-waisted style or at the waist, it will look equally elegant and feminine. If you want to stand out you can also wear a jacket over it for a cool look. For a more youthful look, go with a denim jacket and for a more edgy style, the leather jacket is your best bet. Go with comfortable wedges with this outfit along with minimal jewelry and a cross-body purse. Here are Stylish And Trendy Maxi Skirts For Women. If there is one safe fashion investment, it is in florals outfits. Whether it is a retro or modern take on florals, they never go out of style. Florals look absolutely adorable, especially in spring. In case you don’t want to go with traditional cheeky and feminine vibes of florals on soft pastels, select a dress with floral on a dark background in your dress like black. You can also pair this look with a smart leather jacket and intense boots. This might not be such a huge surprise for many because pants are not a big deal right? Wrong. Pleated pants are not like any other style of pants and they have been very popular on the runways for quite some time now. Pleated ankle length pants are in trend this season and look amazing as seen here with a one-shoulder top. This is a classic look without screaming workplace outfit and pairing red with white give you the perfect contrast for Easter. Style with silver pearl earrings and hot red heels for a graceful look. Whether you go for a little black dress or a slinky gown, you can never go wrong with black! Style it with stylish accessories and get ready to steal all the attention! Red ruby earrings will look sensational with black for dark complexion ladies and tie a logo belt on the waist for classy style. Go with comfortable black flat pumps in case you want to wear little black dress and try high heels for a slinky black gown to give you great height. If you want to look modern and fashionable, you can go for an embroidered tulle full-length gown with a pair of tassel earrings. Tulle skirt gives you a soft and elegant look and the printed top against the simple black skirt will be a stunning outfit choice. Go with white tassel earrings to set off a shiny look for your outfit and blush or beige heels to cut through the dark shade of the skirt. Experiment with different styles such as this striped palazzos with an off shoulder white top. Doesn’t it look stunning? In case you think that palazzos might not be formal enough for Easter, go with striped ones. With a simple white tee and these, you can totally shine. Stand out from the crowd with this unique and sophisticated look this Easter. In recent years, mixing up colors is the new deal in the world of fashion. The idea of color blocking works perfectly when you want to highlight some body part and steal attention for yourself. A black and white asymmetrical color block outfit brings out the best of both the colors and you can surely be the center of attention. A pearl embellished black cap and black boots would complement your dress well. A Breton or fisherman cap is not such a bad idea to start with on Easter. Keep it as your statement piece and see what suits this look best. Keep things casual with a denim dress or denim jumpsuit and look effortlessly stylish. You can also style this look with a suave white overcoat or a fancy shaggy faux fur coat with an over the top chic look. You can choose to go with bright colored mocassins or loafers. Keep a bejeweled clutch and wear hoop earrings for a funky look. Here are 32 Beautiful Denim Dress to Inspire your daily Fashion. Velvet looks great on everyone, especially if it’s in the form of flared pants. Pair it with any simple top of your choice. Play around with different fabrics and use a leather jacket for a great layering option. You can also use a structured velvet blazer instead. Pointed-toe heels will be the best way to finish off this elegant look. If you want to go formal, try a cool double-breasted suit or blazer to look classy this Easter. Women power suit are the best way to dress up this Easter and you can make the look stand out from the usual office wear kind of look, by using cool accessories like a logo belt on the waist or glittery earrings and heels. Checks never go out of fashion whether they are on a shirt or dress. Pair a white satin top with black pants for a glamorous look. You can further enhance your look with pearly slippers and silver jewelry. In case you want to flaunt some skin this time around, cold shoulder sleeves are your best friend. Go with a softer shade of yellow shirt for a cute and fun loving look, and pair it with a white skirt or denim for Easter brunch. Forget everything and go with the most vibrant skirts for Easter. It is a time to celebrate and you couldn’t possibly do that without bold prints and colors. Choose a flowy fabric for the skirt so that it twirls around perfectly. For the mass, try going for light colors with the best one being white. The idea for a perfect dress for mass is that it won’t create any distractions or break any dress codes. You can wear a dress, skirt or anything else you are comfortable in and don’t forget to accessorize! In case you feel chilly, keep a cardigan or unstructured pastel blazer with you for a snug and fashionable look by just draping it upon your shoulders casually. You might just be patiently waiting for summer to come. If you will be celebrating a chilly Easter this year around, a velvet dress is not such a bad choice. Not only will it keep you warm and snug but the fabric in itself in no less royal or elegant. Velvet dress will fall softly and perfectly, and the added details like slits or ruching of the skirt often make the dress more feminine. Make a great impression with embroidered boots and a slim belt at the waist. Some days, simple tees can make you look amazing with a little help. Make stripes look gorgeous by wearing such a ribbed top with white folded waistband trousers. The stylish waistband will cover your tummy fat in case you feel you have gained some extra pounds and want a smooth look. The straight forward cut of the pants will give you a slimming look and wear some amazing silver pearl tassel earrings and bright orangish-red lipstick for breathtaking style. When wearing these pants, you can go with both; stiletto or flat sandals for a fun casual look. We hope you found this article useful and found some helpful tips. Don’t forget to give us your feedback in the comments and Happy Easter! Zonaira is newly married and currently, she's trying to learn how to manage her work with life. After completing her studies, she wanted to pursue her passions to make life more exciting. She's an avid reader who also happens to love writing so she thought, what better way to convert that passion into blogging and article writing? So now she's busy exploring the world, one article at a time. She loves to keep herself updated on the latest trends. Her philosophy in life is to “make thyself better each day” and so her interest lies in making people aware of how they can improve their style and be a better version of themselves.